Why do the colors the priest wears when celebrating Mass change during the year? Can I choose the color I’d like him to wear to match my wedding’s color theme? 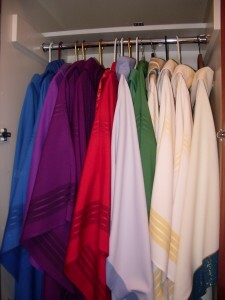 Within Roman Catholicism, liturgical colors (the color of the robes and fabrics used for celebrating Mass and the sacraments) are standardized by the Vatican. They rarely change. Current color selections date from 1969 following the reforms from Vatican II. According to this new rubric (set of rules), Green, the color of hope, is used during Ordinary Time (the counted Sundays and weekdays between them) except when the color for another feast takes precedence. For example, during Ordinary Time, on a weekday the feast of a martyr is celebrated using red vestments (robes). For a wedding, even during Ordinary Time, the priest wears white vestments. The same holds for celebrating Baptism and Holy Orders. Violet is used for the four weeks of Advent and six weeks of Lent, setting a more penitential tone for those seasons. In some communities, blue is used for Advent and feasts of Mary. Red is used when celebrating feasts related to the Lord’s passion, the feasts of martyrs, Pentecost and the sacrament of Confirmation. Red reminds us of the fire of the Holy Spirit and blood that has been shed. Rose is used only twice per year: Gaudete Sunday (3rd Sunday of Advent) and Laetare Sunday (4th Sunday of Lent). Gaudete means Rejoice. Laetare means “be joyful”. The rose vestments are a reminder on these Sundays that the time is nearing to celebrate God’s great gifts of Incarnation and Resurrection. This color cues the celebration as one of joyful expectation. Black is generally not used anymore in the Roman rite, though it is permitted for use on All Souls Day and for Requiem Masses. Rather than focusing on loss and sorrow on these days, we now look to the hope of the Resurrection of the dead and use white to symbolize our faith that God loves and forgives all, calling each of us home. 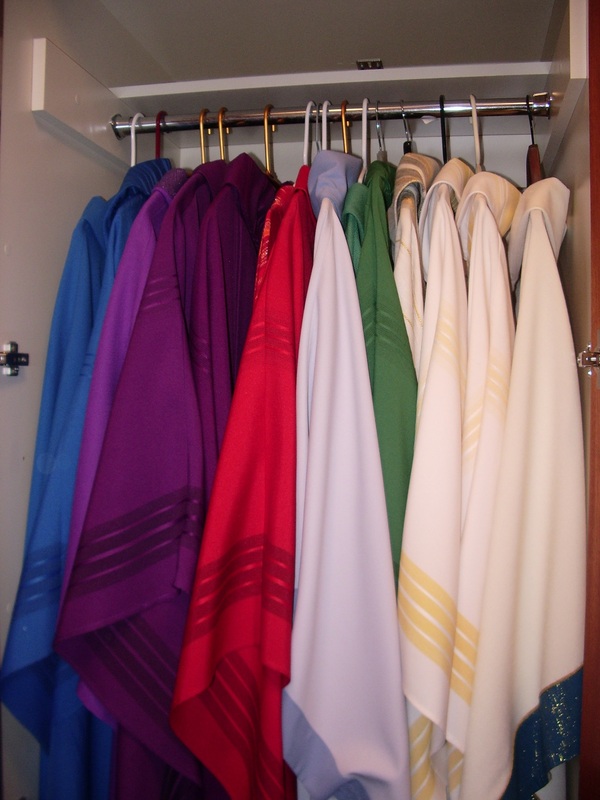 As you can see, the selection of color for vestments and even for the veil that hangs over the front of the tabernacle is set in advance. As you plan your wedding, the community will celebrate with you and the priest will wear our community’s color of joy: white.